One room living is becoming a way of life for many. In order to fit everything into a small space, it's important to understand scale. Call me weird but the happiest days of my life were always those where I lived in one room. It was so easy to organize and there was so little to pay for. I saved time and money and went traveling with all that extra money. There were fewer bills arriving every month - actually none - and I think my life was far fuller than it has been for the past thirty years that I have lived in more conventional habitats. Anyway, I’m back to one room living and I love it! I managed to get a lovely sunny room on the first floor of a Victorian House in North Park San Diego. It is minute - about 8’ x 8’ with a wash basin and a small dressing room and that’s about it. The loo and shower are shared outside, but who cares? I’m going to be writing a lot more about one room living because I think this is where my heart is. I love to look for things that are small, beautiful, and highly-functional. And you’ll be amazed how many of them there are in this day and age. One room living is a great solution for singles and seniors, as well as couples and small families that are temporarily unable to afford a more conventional lifestyle. A bath in a bedroom! Scale is having the right size items for the right size room! The important thing about one room living is scale. For instance, if one had a castle sized room, then one can have a castle sized love seat. But if one has a midget sized room, then the love seat will need to be midget size. There needs to be a direct correlation between the size of the room and the size of the furniture. The principles behind scale for one room living - finding small things that have multiple uses! Search for items that are multi-functional, small, and beautiful to look at! Clever design enables any item to be highly functional despite being very small or beautiful. All too often, designers have sacrificed beauty or functionality for the sake of being small. That is not necessary anymore. 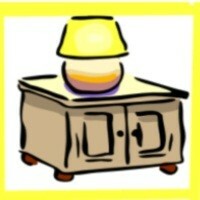 Today, one can find items that are small, highly functional, an beautiful, an these items are ideal for one room living. These small, multi-functional items save on space in a small room, an make storage that much easier. In addition, when something is pretty, it doesn't matter if it is lying in plain sight because it is a pleasure to look at! Small toolkits are a boon in one room room living. There are always nails and hooks to be mounted to walls or a small shelf to be mounted somewhere. An exquisite hammer that is actually a six in one toolkit! This product is available at Amazon as are similar multi-functional tools! Mini Fridge - Great Design, Size, and Pretty! The size is great for scale plus it multi-functions! An example of a multi-functional appliance that fits into a small place. I recently purchased the 2.7 Cu. Ft Emerson Dry Erase Black Compact Fridge from Target. It works for me on several levels because the entire fridge is a dry board (pen and eraser supplied with fridge) plus it comes with magnetic 'dots' that enable me to attach invites and shopping lists on to it. It's size is ideal for my new room and I'm actually quite pleased that I have to watch my shopping because there's only so much I can fit in. What has happened is that I think very carefully about what I will need and I'm not buying anything in case "I might feel like a snack." More than anything else, it's pleasingly pretty! By the way, one of the reasons I shop at Target quite a bit is that it's one of the few stores that spends a lot of money on design. Emerson Dry Erase Black Compact Fridge - 2.7 Cu. Ft. Scale in One Room Living - Your BED! One of the most difficult aspects of one room living is the bed. It's a vital component but it can take up so much space. There are several ways around this. They all work, and it's dependent on the style and size of the room, plus personal taste, as to which option you select. The one rule they must fit is that they must be scaled to the room. It might mean you would select a twin size bed rather than a queen size bed, or even that you might go for a futon or camp size. Get an idea. Design your own bed. Find a friend. Ask him/her to build it for you! The convenience of this design is that the couch does not have to move forward as the back is attached to the wall and just lifts up to provide another bunk bed. Efficient Futon Bed doubles as day time couch. Drawers provide space for blankets and pillows during the day. Color your Futon with a Throw! Surprisingly, once you get used to looking at things in micro size, it becomes very simple to have everything you need in just one room. Laptops are preferable to desktop computers. (Watching TV on your laptop becomes a way of life.) Cell phones are better than land lines. A Kindle or a Nook becomes a more feasible way of reading books. A slow cooker provides the occasional hot meal while easy-to-prepare salads become a healthy way of life. Induction cooking is also very doable in one room. They can easily be packed away in a closet after use. These micro stoves are available at Target at very reasonable prices. Sometimes it takes a little while to get all the pieces together, and that's okay. The trick is to plan ahead, to see how many things can double as something else. For example, the couch doubles as the bed, the fridge doubles as a notice board, your laptop doubles as your TV, and so it goes. Above all, leave space - loads of space. The more space you leave in your room, the bigger it will appear. Also try to stick to light colors as they give a more spacious feel. One thing I've learned is use your space from floor to ceiling. I've read about in earlier years that women would have a quilting frame that hung from the ceiling and could be lowered when they needed it. I wonder if you could do that for a table or some other item you wanted but didn't use all the time? Brenda Reeves, yes, the more I get into it, the more exciting it gets! I'm with you Tess. Smaller is better, and the less I have, the less I have to take care of.